Signal processors, effects pedals, stomp boxes… What’s in a name? That which we call a pedal by any other name would sound just as sweet! What would not sound so sweet, on the other hand, would be a-million and-one of the things plugged into your rig not knowing why they’re there or what to do with them. Last time I talked about the benefits of compression, which led me to want to talk about some of the other heavy hitters in the world of signal processing. The first thing you need to ask yourself is: “what am I looking for?” Are you looking for a boost or more gain? The opposite? Are you looking for something to thicken up your tone, or maybe just some fancy sounding effects? In this article I’ll give some examples for each of these, and an idea as to where they can be used. Let’s say you’re looking to enhance the clarity of your tone, and perhaps even clean things up beyond what the EQ enables you to do. This is where a compressor pedal would come in handy (like I talked about in my last article) or even a filtration/EQ pedal. There are some pedals that allow you to dial in and adjust specific frequencies, which could be useful if you’re playing a venue that doesn’t have a professional sound system / technician. You could also purposely crank or take out certain frequencies to create interesting effects, or to make it easier to get feedback from your amp if that’s your thing! 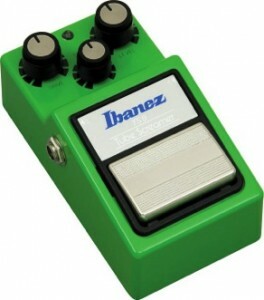 Other pedals have a pre-set frequency range that they alter, such as the popular Ibanez Tube Screamer. This guy pushes your midrange, and is a very effective way to make your lead guitar work…well… scream. Perhaps rather than cleaning up, you’re looking to make things dirty or just give yourself a nice boost. With a tube amp, generally speaking you want your tubes to run hot to get your best tone. That said, the more gain you put in, the dirtier the signal will be when it comes out. 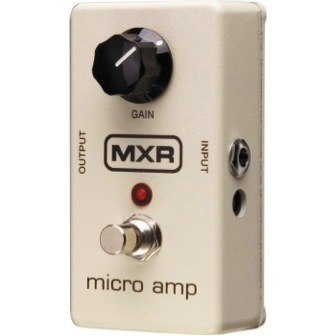 A good boost pedal (I’m partial to the MXR micro amp) will increase the signal level of your guitar before it reaches the amp, thus pushing the amp harder. Think of it as instantly raising the height of your pickups with the flick of a switch… Or stomp of a foot. You can use one of these in band situations during a solo section where you need to be heard, or just to enhance your tone if you like it dirty! Many boost pedals come with an output volume knob, so you could theoretically use it in the opposite way to quiet yourself down, or clean up your tone a bit. Modulation and time-based effects processors are next: these are the ones that fall under the “fancy effects” category. Time-based effects are things like delay and reverb. A lot of amps come with their own reverb installed, but you can always experiment with different pedals to try a variety of different sounding ones. Generally, reverb is used to thicken up your tone. 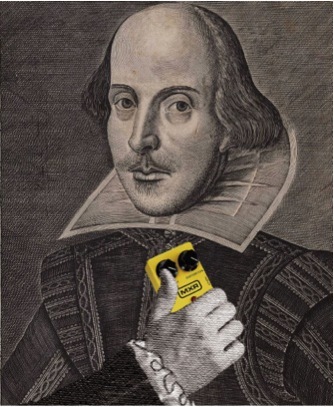 Be careful not to use too much! While it may sound nice and creamy right next to your amp, in large rooms especially you can start to sound very muddy if you over do it. A “slap-back” delay is another way of getting a thick sounding guitar tone. “Slap-back” is a term used to describe a delay of just one repeat that comes very quickly after the initial hit. Again, you can use a delay pedal not just as a tone enhancer, but also as an effects pedal by playing around with the settings! 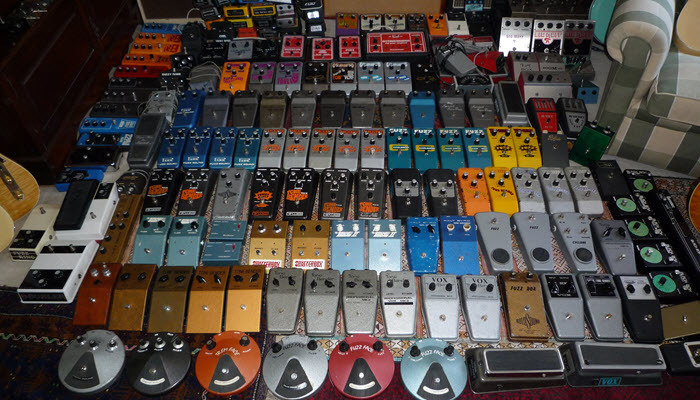 Once you have a few pedals, it’s important to decide which order you’re going to chain them in. While the generally accepted rule of thumb is to start with your dynamics, then do EQs and filters, then modulation, followed by boosts, and finally time based processors… you’re always free to experiment! Maybe you want your delay to go through a boost, or maybe you want to boost everything before you put on that tremolo. After all, these effects you’re using weren’t created without experimentation! There’s a world of soundscapes to explore.